Below are a list of plugins you can use to create attractive landing pages for your WordPress website without knowing anything about programming. NOTE: I’ve only used Thrive and Visual Composer, so those are the only two affiliate links on this page. I never affiliate myself with products I don’t actually use myself. This is a premium plugin that I use to create landing pages here on this site. You can see one of my pages I created here. The entire interface is drag and drop, and you work right inside the page view. So you can see a preview of the page as you are building it. Let’s say you have a landing page for a product, and you want to add some credit card icons. Simply choose that option from the right menu and drag them into the section of the page where you want them to go. And you can style every element by clicking inside it and changing the colors, margins, line-heights, links, button colors etc. The biggest drawback I found is that it takes some getting used to at first because there are SOOOOO many options, but once you get comfy, you realize how powerful it is. Shane, the developer, is also constantly adding new features for free, of course. All elements are mobile responsive so they size down if your site is viewed on a tablet or smartphone. Get Thrive Landing Pages here. Visual Composer was not created just for landing pages like Thrive, but you can certainly use it for that. 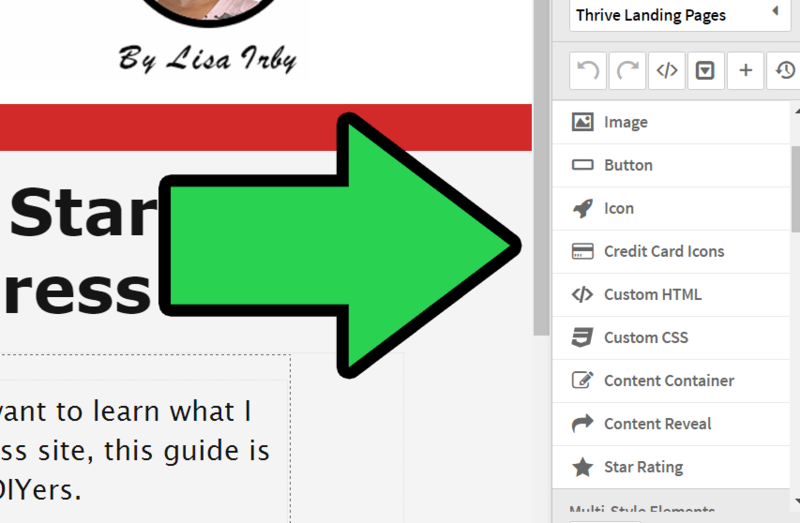 It’s a visual designer for both pages and posts, while Thrive is only for pages in WordPress. I used VC for my homepage. The biggest difference between Visual Composer and Thrive (other than VC being a third of the cost of Thrive) is that Visual Composer’s templates are much simpler. VC is great if you just want a column layout on a page or a post, but their pre-designed landing pages aren’t nearly as jazzy as Thrive’s because they aren’t pre-populated with many images. You just get columns, rows and placeholders for images and buttons. A few of their templates have colors, but I primarily use it for the column layouts. Here’s what that section looks like inside Visual Composer on the back end. So to edit each section of the column/row, I click inside and either add/edit the image, change the button text, button size, etc. I can also duplicate sections and drag things around. So after I created the “Step 1” column, I just duplicated it and created Steps 2 and 3. Thrive lets you duplicate elements too. This speeds up the process tremendously. But notice how I’m working inside the WordPress page editor. Visual Composer also lets you work in the design view like Thrive, but I prefer the back end editor for this plugin. Just like Thrive, VC is also mobile responsive, so all your designs size down for mobile devices. One note of caution: Visual Composer creates a LOT of code on the back end. I personally haven’t noticed any major page loading or SEO issues because of it, but that could turn a lot of people off. In fact, most builders will add a lot of extra code to your pages, which may impact page loading. Also remember to keep large images and animation to a minimum when using these plugins. Fancy features are great, but you don’t want to create very large, bloated pages either. This is, without a doubt, the #1 landing page builder for WordPress, and that’s primarily because it has received backing from a lot of popular and influential Internet Marketers. It’s very, very powerful, but also quite pricey compared to the other options listed here. One of the big selling features of Leadpages is that you can split test versions of your pages to see which one converts the best. People can also join your list via text message, which is really cool! Leadpages is definitely for the serious folks who are ready to invest in top-notch landing page and lead generation software. 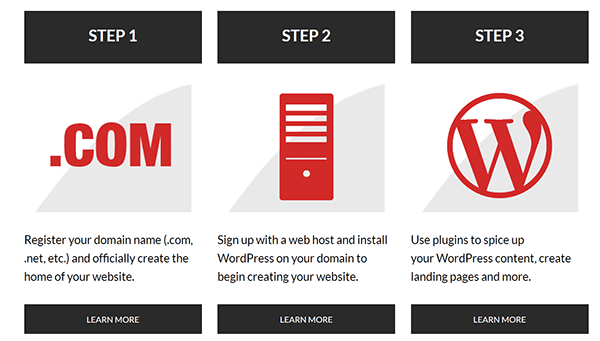 OptimizePress is one of the first premium landing page builders for WordPress. They owned the landing page market for a long time! They re-launched their product a while back and now you get a landing page plugin, theme and membership plugin all in one! I’ve never used OptimizePress, but they have been in the running for one of the top landing page plugins for ages. One of my blog subscribers told me he absolutely loves this plugin. The template designs look very clean and modern, and it’s drag and drop too. Live Thrive, you can use it for unlimited sites. There’s one big catch though: You must use their themes to create full-width landing pages, so that’s a downside. Unfortunately without ever using Beaver Builder, I can’t provide too many details, but you can check them out by clicking the link below. There’s also a free demo, which is a plus. Beaver Builder might be the least popular of the 5, but the overall reviews seem to be great! It’s just a shame you have to use their themes to get full use of the plugin. OptimizePress appears to be losing a lot of market share to Leadpages and Thrive. I haven’t seen as as many recommendations since their re-launch. Leadpages and Thrive seem to be the two that are dominating the landing page market. But as previously stated, of the two, I’ve only used Thrive.